Welcome to PlaceCards.com... Since 1995! At Placecards.com our goal is to provide you with the best service and quality personalized place cards printed with your guests names that will accent your wedding reception or event tables beautifully. We have been serving brides since 1995, making their wedding and event preparation easier. We were voted the Best of Project Wedding in 2008. Ordering place cards online is easier than ever and if you have any questions or concerns give us a call and we will be glad to help you! Our place cards are competitively priced which makes our personalized place cards affordable and an elegant touch to your wedding or any event. Calligraphy printing is an affordable option for your place cards. You no longer need to spend hours writing out all of your guests’ names on your place cards…we take care of calligraphy printing all of your quests’ names, table numbers or names, and the guests menu selection (if desired) on your place cards for you! Just upload your guests’ names on the online order form, sit back, and relax. Check out our advice page for helpful tips and tricks on preparing your guest list. 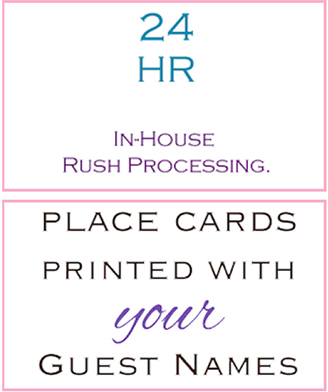 For your ease of mind we also provide a full PDF proof of your place cards prior to printing. We utilize Solid Ink Technology for our calligraphy printed place cards. Solid Ink printing provides a cost effective printing and environmentaly safe option for your place cards and table cards. I Needed My Place Cards Yesterday?!?! We know that you do not always get your guests RSVP’s back in time, now you no longer have to stress about getting your place cards done in time. We offer two levels of Rush Services; where we can have them printed in 24 or 48 hours, and out the door for shipping! Please contact the office if you need assistance determining if you need a rush service or expedited shipping for your place card order. Why should you be limited on how you can personalize your place cards?! 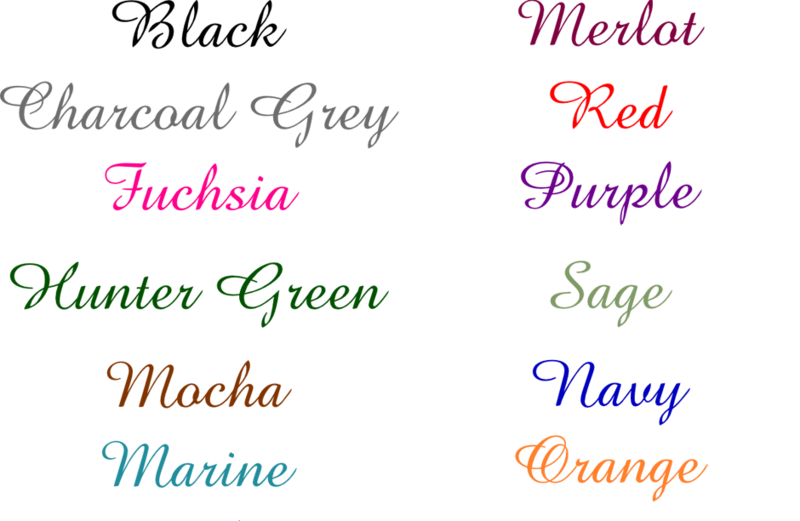 Now you can completely customize your place cards… We have an extensive selection of over 50 font choices, 12 ink colors, and over 70 design combinations and we are always adding more place card designs! We offer a wide variety of design to choose from with themes ranging from bar mitzvahs & bat mitzvahs, bridal showers, baby showers, holiday parties, birthday parties, even designs suitable for corporate meetings. Our place cards are a great addition to any party. If you are needing something special or a company logo just contact the office 1-800-279-1989 or email tom@placecards.com for more information on how we can help you create unique place cards printed with all your guests' names. I just wanted to let you know that we received the place cards and they look absolutely wonderful! It was a good call on your part to replace the Hunter Green with the Sage - I can't thank you enough for taking the initiative and doing this for us. You did a super job - we couldn't have asked for anything more perfect! The place cards look lovely - not harsh, not loud, but also not boring - just perfectly professional and elegant. I've given your details to our office manager, and will refer you to anyone who needs this type of work done in the future. I just received my place cards an I love them! Thank you so much!!! Your speed and quality is far beyond expectations I hope you have a great weekend!